COS Naturals Cellulite Defense is definitely low on the cellulite treatment totem pole. That’s why I give it 1.5 out of 5 stars. It was really just one big disappointment. I literally got NO short term results and after using it for awhile, I barely had softer skin. That’s all… no improvement with my skin tone or dimples, etc. And they market themselves as an “advanced firming and toning treatment”. I saw none of that whatsoever. 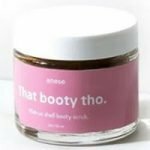 The active ingredients in this cellulite product are so puny. It’s easy to apply but it’s greasy afterwards. The smell is super plain. Luckily, they have a money back guarantee. That’s pretty much the only saving grace here. It’s honestly just an overpriced moisturizer, that doesn’t even moisture well. Save your money and opt for a better product. COS Naturals Cellulite Defense comes out of the bottle as a white lotion. The texture is nice and smooth and easy to disperse. The application process is fairly easy. The bottle has a pop-top lid so you can easily dispense the lotion into your hand. It goes on quick like a regular lotion. As for the directions, you’re going to gently massage the slimming lotion into problem areas like your hips, bottom, thighs, and inside upper arms. Use circular upward motions while applying. Then it says to finish by applying the lotion to your stomach using clockwise circular motions. For best results, it says to apply it regularly into your skin morning and evening. The drying time is super quick. It just takes a minute or two to fully dry. BUT it’s very greasy for some reason. That’s a pet peeve of mine. I don’t want to feel any residue or film from my lotions. In the bottle, this lotion smells just like your typical “unscented” or plain lotion. It reminded me a little of a sunscreen lotion. Regardless, it just smells like a basic lotion. After applying this lotion, the smell pretty much stays the same for a while. It’s just a plain, unscented lotion scent. It’s not that appealing, but at least it isn’t overpowering. I literally saw zero short term results. After using this cream for a while, the only change I saw was that my skin was barely softer. I didn’t see ANY improvement with my cellulite. It’s like a glorified, over priced moisturizer that doesn’t even moisture that well! There are literally only 2 I thought were even somewhat helpful. These are Hyaluronic Acid and Quinoa Seed Extract. Hyaluronic Acid is believed to help firm and tighten the skin and smooth out the appearance and texture. Quinoa Seed Extract has essential vitamins that are thought to help block the formation of cellulite. It may also help prevent fat cell maturation and fat storage. But overall, this cellulite lotion is severely lacking in active ingredients. A 4.0 fl oz bottle costs $24.95 on the COS Naturals website. So you end up paying $6.23 for every ounce of product. I don’t think this is a good deal! I definitely didn’t think this cellulite lotion is worth 25 bucks. You also don’t get a ton of lotion, so I ran out pretty quickly. All COS Naturals products are backed by a 100% Satisfaction Guarantee. You can try their products risk-free. If you’re not totally happy with it, then just contact them and they will refund your money. I’m super happy to see this guarantee in place! 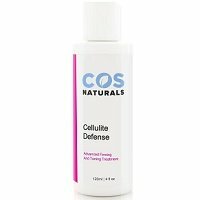 To buy COS Naturals Cellulite Defense, click here. Smell (In Bottle) Smells like plain, unscented lotion. Reminds me of a sunscreen lotion smell.